It’s impossible to list out what each and every type of data recovery job will cost. Data recovery prices are heavily dependent on the type of media needing to be recovered, the file system it uses, whether or not there is any physical damage that needs to be repaired first and a host of other variables. You can expect data recovery prices from any reputable company to start off around $500. Companies that quote you prices of $50, $99, $199 or $300 can be written off almost immediately. These are usually companies that charge additional fees, such as diagnostic or attempt fees on every case they get in, and if your data isn’t recoverable (which it likely won’t be) then they still pocket the upfront charge. If it seems to good to be true it probably is. Also, just because a company may have hundreds of glowing reviews, doesn’t mean those reviews are real, so shop with caution. If you are dealing with physically failed drives and RAID arrays or encrypted hard drives, the price can go up considerably and you absolutely must use a fully qualified data recovery lab if you want to get your data back without taking the chance on making the situation worse. Data recovery prices have nothing to do with the cost of the hard drive being recovered. Paying to recover data makes no sense if the data is worthless. Having a hard drive repaired is expensive, and you can get a new hard disk for around $100. The value of the actual data is what you have to consider. Only you can put a price or a value on the data that is lost. Imagine if you had a million dollars locked in a $100 safe. Does it really matter if you can just go buy another safe for $100? No, you want to get what’s locked inside. It’s the same way with data recovery. It’s not necessary to call us to get prices on data recovery if you know the data isn’t something you really need. Will Data Recovery Prices Come Down? Data recovery prices have been steady for over a decade now. They haven’t really dipped much, and if anything, they’ve actually increased. As companies equip themselves with better technology and hard drives become more and more complex, it has caused the prices to go up. Where 10 years ago the high end of a physical recovery on a hard drive with a head failure may have been around $1,600 to $1,700…now we are seeing some companies quoting as high as $3,000+. 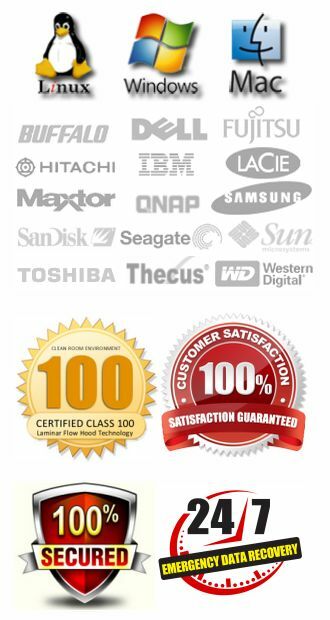 How Does ACS Data Recovery Compare To Other Companies? At ACS, we don’t really focus on what other companies are doing. We will shop and price other companies just to see what the market is doing, but we don’t build our business model or pricing around other companies. In fact, even if you don’t want to send your media to us, we encourage you to send it to another reputable company. We even list some of our competitors right here on our website. It’s more important to us that you actually get your data recovered, and use a good company, as opposed to falling victim to some of the cheap data recovery scams that are out there. Some companies are cheaper than us and some are more expensive, but you can pretty much eliminate any company that says they can recover your data for $100, $200 or $300. Hard drives are extremely complex, and there is no way a company can put in the time and resources needed at those prices. How Can I Find Out How Much Data Recovery Will Cost Me? We can give you a very accurate expectation of what your recovery cost may be during our initial phone conversation. The cost estimate will depend mostly on the size of the drive and the suspected problem that it has. We will take note of any details you can provide describing the situation that occurred when your media failed. Once we have that information we can narrow down what the price might be for your recovery. As always, we won’t know for sure until we complete our initial evaluation, and you can CLICK HERE to create your data recovery case and get an evaluation. There is no charge for this evaluation and there is no charge if the data is not recoverable in most cases. For more information and to get a free quote, call 1-800-717-8974. Do You Charge If My Data Is Not Recoverable? In most cases we only charge you if the recovery is successful. 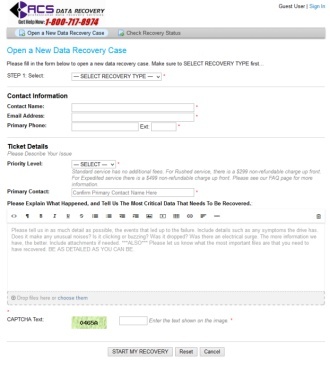 A successful recovery means we actually recover the data you are looking for, not just some random file or two. In most situations we can either recover all of the data or none of it. Very seldom are we able to only get a partial recovery. If for some reason there is significant damage to the platters that is preventing us from getting a complete image, we will analyze the data layout and let you know what data we can recover. We can even generate a file list at that point for you to review. The only exception to our no data / no charge policy is if a hard drive has already been opened prior to our receipt. In those cases we charge a non-refundable fee up front that is credited toward the recovery cost if the recovery is successful.